For years Hot Wheels has allowed fans of all ages to experience the thrill of gravity-defying jumps, loops and leaps. 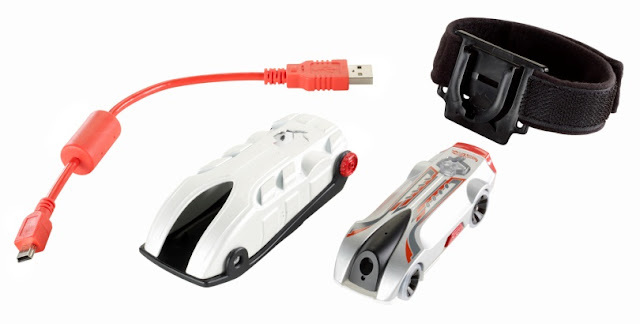 With the launch of Hot Wheels Video Racer, you can add to the excitement with a real hidden micro camera, giving you a vantage point from the driver’s seat! Hot Wheels Video Racer will record all the action as the car speeds through your Hot Wheels track sets – but that’s not all – because with special removable straps and mounting brackets, you’ll be able to hook your Hot Wheels Video Racer onto helmets, skateboards, bikes – or anything on wheels! Then, with specialized editing software fromHotwheels.com/videoracer, your video can be edited with music, transitions, sound effects and graphics, to create your very own fuel-injected vehicle masterpiece! Hot Wheels Video Racer also has a built-in LCD screen for instant playback. The suggested retail price for Hot Wheels Video Racer is $79.99. The kids were VERY excited to get the Hot Wheels Video racer to review. They love the idea of being able to record the stuff that they do. First thing I noticed after opening the package (which is far larger then it needs to be...) was that Hot Wheels had included several ways to use the camera. In the box was the Video Racer Car, a USB cable, a sturdy cage to put the video racer in when using the camera other ways, 2 strap based mounting brackets and 2 other brackets with squares of double sided tape. We have tried the video racer handheld walking, we’ve strapped it to a helmet and ridden on a bike, we’ve stuck it to the dashboard of the van, and we’ve even run it down some Hot Wheels track. The video quality is quite good considering that the camera is so small. The audio is less then ideal, in part because the microphone picks up a lot of vibrations and wind noise which is captured along with the audio you want. The controls on the Video Racer are rather simple. There is a sliding on/off switch on the side. A record on/off button on the top. Underneath the car is the small LCD and two buttons. There is a ‘landscape’ and a ‘track’ icon indicating two kinds of shooting. All in all, it’s very simple to use. When you turn it on, the top button turns green, you press the button to start recording, that’s all. Now, as far as footage to show you from the camera. The first time we used the camera to create footage for this there was a wipeout, a bloodied knee, and some uncomfortable noises made by the owner of the knee.